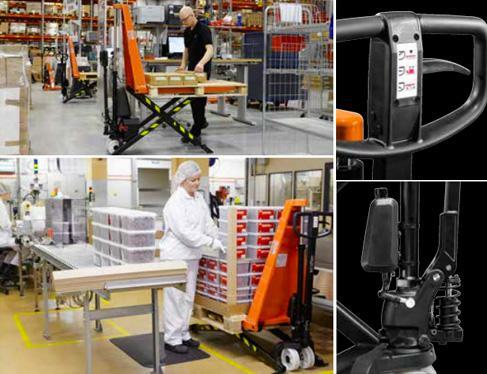 Suitable for horizontal transport, order picking or loading/unloading, the high lifting hand pallet trucks in the H-series offer lift heights up to 800 millimetres. Providing increased versatility and operator comfort, the forks on our H-series models can be elevated to an ergonomic working height for easy load transfer, or for use as a work table next to production lines. The automatic height adjustment modifies the fork height automatically, ensuring the safe movement of goods with minimal effort. The H-series range also includes Inox stainless steel truck models for working in corrosive environments. Designed for applications that demand optimal hygiene, the BT Lifter HHM100 and HHL100 Inox models have a high-grade stainless steel frame and galvanised scissor legs and pump unit. This structure offers durability and resistance to corrosion. 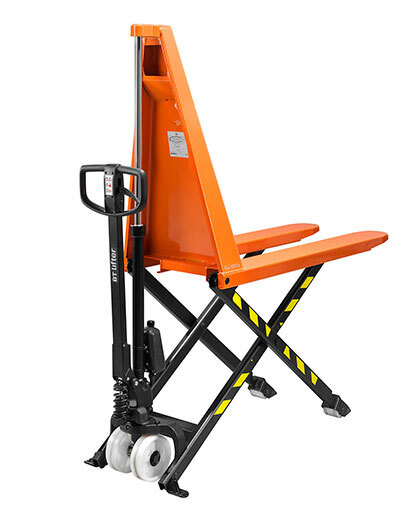 With lift heights of up to 800 millimetres, these long-lasting hand pallet trucks are available with manual or electric lift for improved comfort. The automatic height adjustment on the HHL100I PH with photocell technology keeps the top of the load always at the same height, for efficient load transfer and order picking.